When we started blogging last fall, Cara & I didn’t know much about how to blog or what tools to use. Over the past year, we’ve accumulated a few resources that have helped us a lot in designing & editing our blog. Just to be clear, this post isn’t sponsored by anyone & all the opinions are 100% mine. GIMP, a free photo editing and design software, is the first tool I used when we started designing our blog back before we even launched. I’ve been using it for almost two years now, and I love it. It’s a little clunkier than Photoshop, but it’s FREE, so I can deal with that. I used it to design our header & sidebars, and all the primary photos on my posts (like any time you see words on a picture). And if you run across any problems or want to learn a new trick, just google it – there are thousands of great GIMP tutorials online. You can download GIMP for free here. Photobucket is a great resource if you use pictures a lot in your posts. Every photo you upload to your WordPress site takes up some of your space, and it will make your site run slower if you have a ton of photos. By uploading them to Photobucket instead of WordPress, you can outsource that space to the Photobucket site. It’s free to set up an account, and easy to use – just copy & paste the hyperlink for the picture into the HTML ‘text’ tab of your post. UPDATE: DO NOT USE PHOTOBUCKET. Most of the pictures on our site were taken by us, but sometimes we just don’t have any good pictures that go with our post. Once we signed up with Death to the Stock Photo, that wasn’t a problem. Every month, they send ten high-quality photos to my inbox for free, and I can use them for whatever I want (within reason) either blogging or commercially. The photos are always beautiful & they’re generic enough that there are several every month that are useful to us. We’ve really only used a handful of them for posts (like we have for this post), but it’s comforting to know that we have a growing stash of quality stock photos for when we need them. This is a free WordPress Plugin that deals with your spam comments for you. Once we’d been blogging for about six months, we started to get regular spam comments. It was always disappointing to see that what we thought was a nice comment by an interested reader was just junk, and it was annoying to have to sort through the comments to delete them. After uploading Akismet (we chose the free personal plan),we have had very little spam get past their filter. We don’t even see it, it goes straight to the spam folder. Since the spam volume has only gone up with time, this plugin only increases in value for us. Last month we received over 14,000 spam comments, and we only saw 2 of them get past their filter! After we had been blogging for a while, we noticed these cute author profile boxes at the bottom of fellow bloggers’ posts. Since there are two of us who regularly contribute and we have other occasional contributors (like Katie this month), we wanted to be able to display a short author bio on each post. We did some research & tried out a few different plugins, but this one is our favorite. With the Fancier Author Box, you can display a short bio, a photo, and even links to the author’s personal social media sites and there’s the option to display the most recent posts by that author. We really love it as a way to connect better with people who happen upon our site from places like Pinterest. You can see the author box at the end of this post just above the comments section. 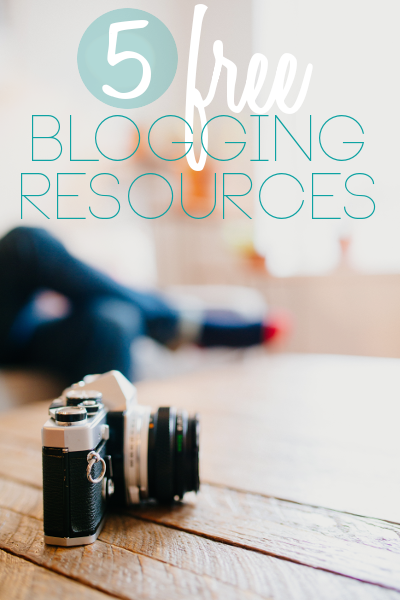 And there you have it, my top five free blogging tools. There are certainly many other tools and plugins that we use, but these are the ones that we rely on heavily, and they always get the job done. Are there any great resources that I’ve left off this list? Let me know in the comments!